The Dusty is a simple way to feel comfortable during your long shift. Uncomplicated, lightweight and open-heeled, it skips the details and gets right to the point — comfort. 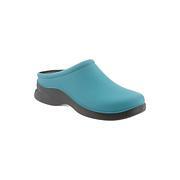 Cushioned, all-day comfort features include a microfiber footbed with excellent arch support. Slip-resistant, oil-resistant, non-marking, shock absorbent outsoles provide superior energy return.